Federal Reserve Chair Janet Yellen opened her statement in today’s press conference announcing “no change” to the federal funds rate, despite of a positive outlook on the US economy, based on reported improvements in the labor market, specifically an average of 230,000 new jobs in the last three months, along with growing household spending and positive consumer sentiment. A positive outlook was announced despite of stalled wage growth, a growing number of part time employees seeking full time employment, weak business investment, downward outlook on GDP, soft net exports and weak global economic conditions. Economic expansion and growth is expected to continue, pushing towards a 2% inflation target within 2-3 years, as well as a gradual “tightening” of monetary policy towards a target federal funds rate in the range of 3% by 2018, further increasing in the longer run. However, Yellen goes on to say that despite of the positive outlook and current assessments of appropriate monetary policy, they will remain “accommodative” due to elevated uncertainty and the Fed is prepared to soften policy with the ability to lower interest rates down to zero to offset possible global economic pressure. 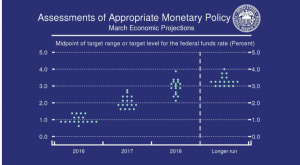 Further rate increases are said to be determined on a “live” basis as new data is reported and April’s rate considerations are to be considered at that time. Yellen was asked whether “negative” interest rates have been considered. Yellen responded by saying that it has not been a focus of discussion due to a positive economic outlook. A downward forecast in global growth was reported, citing downward pressure from the weight of low oil prices in many countries, specifically mentioning our neighbors to the North and South, Canada and Mexico. Japan reported negative growth in the 4th quarter of 2015. Oil is expected to stabilize due to market decline in drilling. Current consumer spending is said to be aided by current low oil prices, benefiting households by approximately $1,000 in savings per year, although, current spending was said not to be as strong as “could be”. In increase in oil prices was said to have low significance in monetary policy. Consumer sentiment was observed to be in “solid territory” as households have been helped by low oil and stronger labor market. Yellen stated that almost all demographic groups have seen improved labor market conditions, despite inequalities existing since the 1980’s.